Former Illinois congressman Aaron Schock pushes back on 'The Ingraham Angle' against allegations that he misused campaign funds. 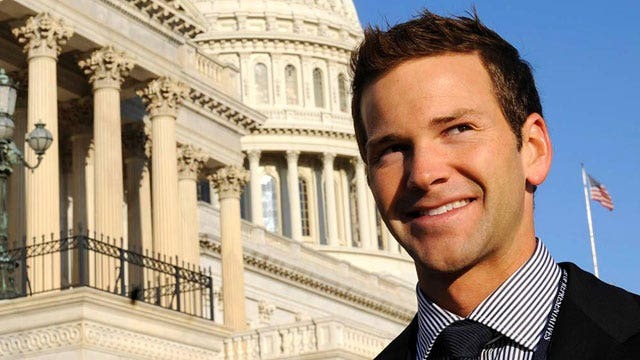 Federal prosecutors in Illinois have agreed to drop charges against former Rep. Aaron Schock in exchange for paying back tens of thousands of dollars to the IRS and his own campaign. The surprise deal came during a status hearing for the former Republican lawmaker. Under the new agreement, the 37-year-old Schock will have to pay $42,000 to the IRS and $68,000 to his campaign fund in return for having felony charges dropped. Insetad of a felony charge, Schock&apos;s campaign pleaded guilty to a misdemeanor count of failing to report expenses properly. "I am very pleased this case is concluding," Schock said in a statement. "This case has dragged on for more than four years and I am ready to put this behind me and move forward." He added: "I will be following very closely the terms of the agreement reached in court today, including financial restitution, and I am ready to move forward with my professional and personal life." U.S. District Judge Matthew Kennelly approved the deal after prosecutors called it a “fair and just” outcome given that Schock has no previous criminal record and has left public service, the Chicago Tribune reported. The indictment charged Schock with wire fraud, falsification of election commission filings, filing false federal income tax returns, making false statements, mail fraud and theft of government funds. It also alleged he spent $40,000 in government funds to redecorate his Washington office in the style of the television series "Downton Abbey," and had asked the House to reimburse him for nearly $30,000 worth of camera equipment. It also accused him of running up a $140,000 mileage tab over six years, reimbursements for 150,000 more miles than his vehicles actually traveled. Schock has maintained his innocence and his attorneys have described the case as an attempt to embarrass and humiliate him. They contend many of the issues in the indictment were administrative ones that many members of Congress grapple with. The announcement on Wednesday comes just weeks after the U.S. Supreme Court declined to take up his appeal.